She may not wear a cape or a fancy costume, or possess some special namesake superpower - but "mom" really is just another word for "hero." Wildlife rescuers from the Animal Concerns Research and Education Society (ACRES) in Singapore recently had the chance to witness the life-saving actions of one unsung mother hero firsthand. The team had just stepped in to rescue a baby fruit bat who had somehow become stranded while still too small to fly on his own. In order to truly help him, they would need to reunite him with his parent. 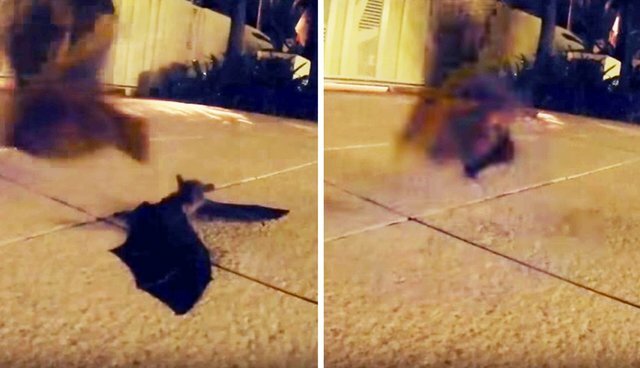 Since rescuers had no way to signal the baby's mother themselves, they let the tiny bat's cries for help alert her - and within minutes, she came swooping in to save the day. "The baby bat was found lost and stranded almost two hours prior to this reunion. [I]t was amazing to see that the parent was around the area and was so quick to pick up on her baby's calls for help and fly around us," ACRES wrote on YouTube. "It took her about 2 minutes to get to her baby as she flew in circles trying to accurately pinpoint where her baby was and negotiate her way to him. We stayed a distance away as we watched in excitement hoping for the reunion to be a success." A job well done to all involved, especially this story's real hero, Mom.